Although improvised solos comprise the heart and soul of jazz music, discographies, at least the ones that have attempted to cover the entire gamut of the genre  such as those by Schleman,  Delaunay,  Rust,  Jepsen,  Bruyninckx,  Raben,  and Lord,  have excluded solo information (except for vocal credits). Historically, these discographies were designed and utilized as catalogs of recording details that omitted analysis of the musical performances. And as the volume of recorded jazz expanded due to the music’s popularity and technological advances, another factor came into play: The wide-net approach mandated by these comprehensive publications — eventually covering thousands of recordings — was clearly incompatible with the level of scrutiny required to acquire solo data. The time and labor needed to accurately compile such details reach impractical levels. Thus the reporting of solos has been left to certain specialist discographers focusing, for example, on a single artist,  and even in many of those cases, the required investments in effort and time can be daunting. Given the original intent and scope of jazz discography, one might question whether it is appropriate or necessary to include solo information in such works, but certainly, the more data presented characterizing the performances, the more useful the project will be to musicians, historians, researchers, and collectors. In general, a discography with solo information serves as a comprehensive listening guide that indicates when the artists are featured and in what context. More specifically, the solo data reveals how alternative takes of a given song differ which, in turn, suggests clues as to what the artists involved may have been striving for and provides opportunities for solo comparison. It also directs attention to the manner in which a soloist’s explorations of frequently recorded material evolve over his or her career. As with most aspects of discography, there exist no universally accepted rules for the scope and display of solo information. Some authors have opted to include data only for the subject artist while others show information for all soloists. What follows is a summary of several published artist discographies and related publications to get some idea of how this challenge has been addressed. It should be noted that the examples, presented chronologically by publication date, were selected because they conveniently illustrate various approaches, but the list should not be considered comprehensive. Duke Ellington (p), Ray Nance (violon), Rex Stewart (tp), Ben Webster (ts), Tricky Sam [sic] (tb), Barney Bigard (cl). What this describes is Stan Levey (drums — actually a 4-bar introduction), Stan Kenton (piano), Conte Candoli (trumpet), and Lee Konitz (alto saxophone). The arranger is Bill Russo. Translation: alto sax, Jimmy Powell; tenor sax, George ‘Buddy’ Tate; trumpet, Harry Edison; tenor sax, Eli ‘Lucky’ Thompson; trombone, William ‘Dicky’ Wells; piano, Count Basie. The arranger is Wilbur ‘Buck’ Clayton. It should be noted that in his subsequent projects covering Julian ‘Cannonball’ Adderley,  Thelonious Monk,  and Milt Jackson,  Sheridan does not include solo information. The analysis continues with a historical reference for comparison and a critical evaluation of Young’s performance. PW is Paul Webster (trumpet) and JT is Joe Thomas (tenor sax). WB is arranger Will Beines, and DG is vocalist Dan Grissom. Choruses: Theme with PARKER bridge; ensemble interlude (12 mm. ); PARKER (break, AA), Davis (BA); Thompson (AA), Garrison (B); Theme (A). So regarding duration, A = 8 bars; AA = 16 bars (0.5 chorus); B = 8 bars (bridge); BA = 16 bars (0.5 chorus) starting at the bridge. Certainly one of the most thorough and detailed projects aimed at documenting the recorded history of a jazz icon, this massive work comprises two volumes and well over one thousand pages. Part one contains a users guide, keys to abbreviations, instruments, countries, musicians, and discs as well as the Ellington sessions, each one containing track titles rendered unique by a code designation. Part two includes another users guide, sections on titles, discs, and musicians. All of the data in the two volumes is interconnected by a complex system and much page turning is required to get the complete picture of a given session. Other title - Tizol’s Stomp. It should be noted that 2° means chorus two, 3°, chorus three, etc. and that choruses are separated by semicolons. Also, no distinction is made between a solo section that is improvised (e.g., Ben Webster on “Raincheck”) and one that is a theme statement (e.g., Juan Tizol on “Raincheck”). He also indicates solo position if there is more than one tenor saxophone solo on a track as (2.s), meaning Thompson’s is the second solo on that instrument. Solo durations are not provided. Arguably the most prolific exponent of jazz solography, Jan Evensmo has compiled nearly 150 individual artist solo histories (mainly tenor saxophonists and trumpeters) and made them available for download as pdf files from his website JazzArcheology.com (“Your Guide to the Treasures of Vintage Jazz”). There he offers details of both his vision and methodology, developed over many years of research. His scope is confined to the subject artist but quite a bit of information is provided including durations and tempo approximations and a standard discography format is employed. Conventions and abbreviations are clearly explained and the reports are updated as new information becomes available. The second and third takes of “From Dixieland to Bop” are not auditioned. Regarding the tempo designations, (S) is slow, less than 92 beats per minute; (FM) is “fast medium,” between 184 and 240 beats per minute; (M) is medium, between 128 and 184 beats per minute; (F) is fast, more than 240 beats per minute. Another European exponent of jazz solography is Mario Schneeberger who has covered trumpeter and vocalist Frank Humphries, pianist and arranger Marl Young and trumpeters Freddie Webster, Willis Nelson, and Dupree Bolton. As with Evensmo, the compilations are in pdf format. At this point in time, jazz discography in general and the solo issue in particular must certainly exploit computer technology and the Internet. These tools offer many significant advantages and opportunities relative to traditional publication in book or pamphlet format regarding all aspects of the discographical process, from data entry and storage to display. In addition, given the reality that discographies are never finished, updates addressing the inevitable errors and omissions can be more easily and routinely published. 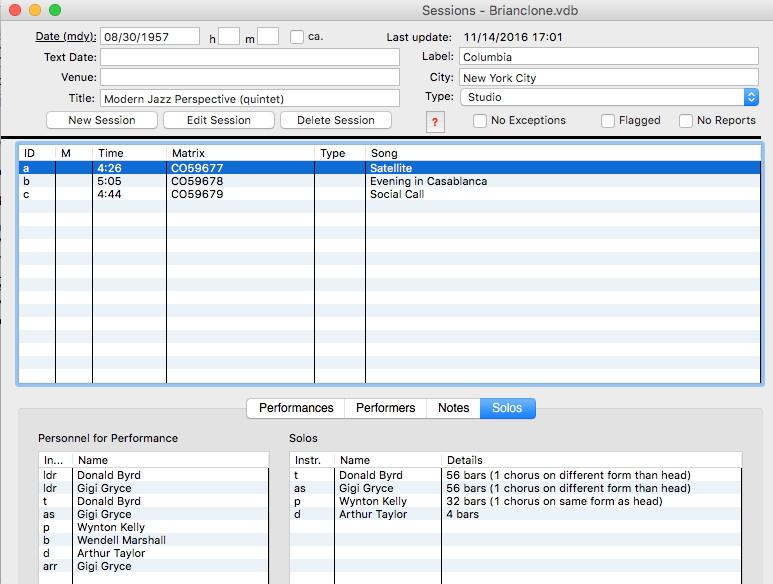 Since its first incarnation in 1997, BRIAN, a relational database application named for the late Brian Rust, has become the state-of-the-art tool for storage and display of discographical data involving jazz and pop music. To date, 88 complete artist discographies and over 400 leader entries (artist discographies excluding sideman sessions) have been compiled and published using this application. In addition, musicians have used it to keep track of their own recording sessions and collectors for organizing their personal holdings. Throughout its twenty years of existence, BRIAN has undergone substantial upgrading of its capabilities as well as enhanced ease of use and improved discography display. Recently, a feature has been added that allows entry of solo information as part of a session, a development that offers great promise in terms of providing a standardized way of displaying the solo data. As a bonus, an artist’s solo history is searchable. But before getting into specific examples, a few words about acquisition of the solo data. Album and compilation liner notes sometimes name the soloists and solo order on a given track, even noting the number of choruses in certain instances. Unfortunately, such details are not routinely provided or are incorrect and the only sure way to gather the required information is by listening. This, of course, mandates access to recordings that are often obscure and difficult to locate, although the amount of material that can now be found on YouTube and similar sources is quite astounding and ever increasing (legal ramifications notwithstanding). Archives and collectors can be very helpful also. In my work, nearly all of the solo information has been gathered by listening over many, many hours, a process that has had the added benefit of revealing errors and omissions in other data such as instrumentation and track timings. To demonstrate how the solos are entered using BRIAN, let us return to the Lucky Thompson RCA Victor session of April 22, 1947. Fig. 1 shows the session window for this recording date and the solo information for track h, “Boppin’ the Blues”. The order in which this was created was first to enter the performances (songs) with associated information (matrix nos., timings, type — e.g., master (default) or alternative), then the performers for each track. 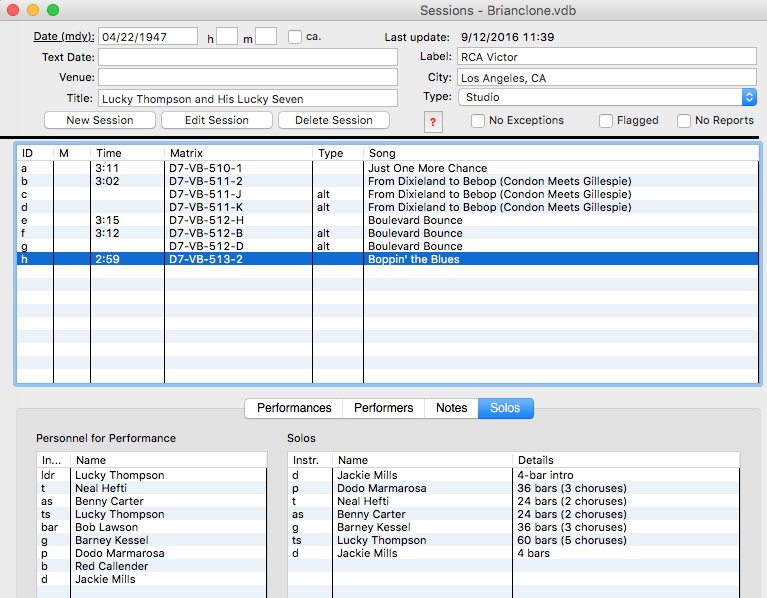 When this is complete, selecting the “Solos” tab provides a blank slate that is filled in by simply dragging the performer’s name from the personnel list to the left column of the “Solos” window. The instrument automatically moves with the name and the solo order is from top to bottom. This procedure is followed for all tracks of the session. At this point, the user can stop and the discography will show the soloists listed in the proper order for each track; however, more information can be added using the “Details” column. Here the solo’s duration in bars/measures and choruses and other descriptors can be included. My preferences are shown which, for the time being, generally exclude some of the parameters listed above such as tempo, key signature, meter (see below), or song structure. But the nature and extent of information provided is up to the user given a field limitation of 504 characters. Since the BRIAN-generated discographies are published online as HTML files, space and formatting constraints associated with print publications do not come into play. Therefore, I have opted to make my solo “Details” as clear and user-friendly as possible by minimizing the number of often confusing abbreviations, for example. In general, durations are expressed as both bars and choruses, at least when the song structure is known with certainty. Figure 1. Screenshot of BRIAN entry for “Boppin’ the Blues” Lucky Thompson, April 22, 1947. Barney Kessel (g) on a-d, h.
As can be seen, there are duplicate entries for the introductory solo on “Boulevard Bounce” that arise from a master and an alternative take. Future modifications of the software will involve ways to render the list entries unique, for example, by including performance reference IDs  as part of the data export. Figure 2. Screenshot of BRIAN entry for “Satellite” Byrd-Gryce Jazz Lab, August 30, 1957. In this case, the two solos shown for the titles “Evening in Casablanca” and “Social Call” are from the same take rather than from two different takes and again, future modifications will be necessary in order to render this unambiguous. The September 12, 1961 Frank Strozier session for Jazzland Records presents a third example which shows, among other things, how alternative time signatures are handled. Since the default meter is 4/4, alternative meters are designated in the “Details” as shown for track c, a waltz. Figure 3. Screenshot of BRIAN entry for “The Need for Love” Frank Strozier, September 12, 1961. The display for this session (again with issues hidden) indicates codas and cadenzas and another example (track g) of 4-bar exchanges. Here, the unusual structure of “Just Think It Over” is described in the notes rather than as a solo detail. Frank Strozier (as) on a-e, g-h, (f) on f; George Coleman (ts) on a, c, f, h; Pat Patrick (bar) on a, c, h, (f) on f.
The theme of track h has a rather unusual 44-bar structure: 8+8+8+8+12. Despite the progress described above, the acquisition of solo data from recordings will always be a time-consuming endeavor, obviously requiring real-time listening and sometimes, careful analysis in order to provide a thorough and accurate complement to a discography. Whether this effort is justified will be up to the compiler. Nonetheless, the ability to enter and store solo information using a database, and display it in a clear and uniform manner as BRIAN now allows is a major breakthrough. The examples presented above are early days results and software refinements will certainly be made as more experience and feedback is gained with the solo entry feature. With regards to the solo descriptions (“Details”) shown, it is not my intention here to establish or recommend conventions for how such data should be displayed. As noted, the software allows flexibility and it is quite possible that other users will prefer much different terminology. However, the general rule that I hope discographers will follow is that the presentation is clear and avoids cryptic or arcane abbreviations and jargon. Like the music itself, jazz discography has come a long way in the last century. It seems that we now have the tools to build upon the substantial achievements of the many discographers mentioned above. Hopefully, the groundwork has been laid for future session-based jazz discographies that present a truly comprehensive picture of an artist’s recorded history including documentation of the overarching improvised solo component. Allen, Walter C. Hendersonia: The Music of Fletcher Henderson and His Musicians — A Bio-Discography, Highland Park, NJ: self-published, 1973. Berger, Edward. Basically Speaking: An Oral History of George Duvivier, Metuchen, NJ: Scarecrow Press, 1993. Berger, Edward. Joe Wilder and the Breaking of Barriers in American Music: Softly, with Feeling, Philadelphia, PA: Temple University Press, 2014. Berger, Morroe, Edward Berger and James Patrick. Benny Carter: A Life in American Music, Second Edition, Volume II, Lanham, MD: Scarecrow Press, 2001. Bruyninckx, Walter and Dom Truffandier. 85 Years of Recorded Jazz. CD-ROM, Mechelen: self-published, 2004. Büchmann-Moller, Frank. You Got to Be Original, Man! The Music of Lester Young, Westport, CT: Greenwood Press, 1990. Carner, Gary. Pepper Adams’ Joy Road: An Annotated Discography, Lanham, MD: Scarecrow Press, 2012. ———. “Jazz Discography in the 21st Century: One Perspective,” Names & Numbers 65, (April 2013), 15–19. Delaunay, Charles. Hot Discography, New York: Commodore Record Co., Inc., 1943. Epperson, Bruce D. More Important than the Music: A History of Jazz Discography, Chicago: The University of Chicago Press, 2013. Flower, John. Moonlight Serenade: A Bio-discography of the Glenn Miller Civilian Band, New Rochelle, NY: Arlington House, 1972. Gazdar, Coover. First Bass: The Oscar Pettiford Discography, Bangalore, India: self-published, 1991. Jepsen, Jørgen Grunnet, ed., Jazz Records: 1942–1962, a discography, Holte, Denmark: Karl Emil Knudsen, 1966. Komara, Edward M. The Dial Recordings of Charlie Parker, Westport, CT: Greenwood Press, 1998. Lord, Tom. The Jazz Discography. CD-ROM. Vers. 17.0, West Vancouver: Lord Music Reference Inc., 2016; the entire discography is also available as an online subscription at https://lordisco.com/. Lyttkens, Bertil. The Jimmie Lunceford Legacy on Records, Stockholm: self-published, 1996. Massagli, Luciano and Giovanni M. Volonté. The New Desor: An Updated Edition of Duke Ellington’s Story on Records, 1924–1974, Parts One and Two, Milan: self-published, 1999. Panassié, Hugues. Discographie Critique des Meilleurs Disques de Jazz, Paris: Robert Laffont, 1951. Pirie, Christopher A. with Dr. Siegfried Mueller. Artistry in Kenton: The Bio-Discography of Stan Kenton and His Music, Volume One (Revised Edition), Vienna: self-published, 1969. Raben, Erik, ed. Jazz Records: 1942–80: A discography, Vol. 1: A–Ba, Copenhagen: JazzMedia Aps, 1989 and six other volumes; Vol. 8 (Fre–Gi) was published in 2004 as a CD-ROM but no further volumes were published. Rust, Brian. Jazz Records, 1897–1942, 4th Ed., New Rochelle, NY: Arlington House, 1978. Salemann, Dieter. Roots of Modern Jazz — The Be Bop Era, Vol. 13: Solography, Discography, Band Routes, Engagements of Eli ‘Lucky’ Thompson, 1943–1950, Berlin: self-published, 2001. Sears, Richard S., V-Discs: A History and Discography, Westport, CT: Greenwood Press, 1980. Sheridan, Chris. Bags’ Grooves: A Discography of Milt Jackson, Parts 1 & 2, Almere, The Netherlands: Names & Numbers, 2006. ———. Brilliant Corners: A Bio-discography of Thelonious Monk, Westport, CT: Greenwood Press, 2001. ———. Count Basie: A Bio-Discography, Westport, CT: Greenwood Press, 1986. ———. Dis Here: A Bio-Discography of Julian ‘Cannonball Adderley’, Westport, CT: Greenwood Press, 2000. Schleman, Hilton R. Rhythm On Record, London: Melody Maker, 1936. Weir, Bob. Lucky Thompson Discography, Almere, The Netherlands: Names & Numbers, 2010. The author is grateful to Steve Albin for creating and upgrading the BRIAN software and for providing assistance with its use. Also, thanks are due to the following who provided helpful suggestions and comments regarding published discographies containing solo information: Ed Berger, Gary Carner, Jan Evensmo, Michael Fitzgerald, Joe Medjuck, Dan Morgenstern, Howard Rye, and Mario Schneeberger. This refers to discographies such as those mentioned that attempt to cover all jazz recordings up to the time of publication. The term “metadiscographies” has sometimes been used in this context, but see: Epperson, Bruce D. More Important than the Music: A History of Jazz Discography, Chicago: The University of Chicago Press, 2013, 10–14. Hilton R. Schleman. Rhythm On Record, London: Melody Maker, 1936. Charles Delaunay. Hot Discography, New York: Commodore Record Co., Inc., 1943. Brian Rust. Jazz Records, 1897–1942, 4th Ed., New Rochelle, NY: Arlington House, 1978. Jørgen Grunnet Jepsen, ed., Jazz Records: 1942–1962, a discography, Holte, Denmark: Karl Emil Knudsen, 1966. Walter Bruyninckx and Dom Truffandier. 85 Years of Recorded Jazz. CD-ROM, Mechelen: self-published, 2004. Erik Raben, ed. Jazz Records: 1942–80: A discography, Vol. 1: A–Ba, Copenhagen: JazzMedia Aps, 1989 and six other volumes; Vol. 8 (Fre–Gi) was published in 2004 as a CD-ROM but no further volumes were published. Tom Lord. The Jazz Discography. CD-ROM. Vers. 17.0, West Vancouver: Lord Music Reference Inc., 2016; the entire discography is also available as an online subscription at https://lordisco.com/. This exclusion also applies to the many record label discographies compiled by Michel Ruppli and co-workers. For a discussion of label discographies see Bruce D. Epperson. More Important than the Music: A History of Jazz Discography, Chicago: The University of Chicago Press, 2013, 159–166. This also applies, although to a lesser extent, to other important data usually not found in the all-encompassing discographies such as track timings, composer credits, and issue dates. For a discussion of specialized discographies including artist discographies, bio-discographies, and solographies, see Bruce D. Epperson. More Important than the Music: A History of Jazz Discography, Chicago: The University of Chicago Press, 2013, 127–158. Hugues Panassié. Discographie Critique des Meilleurs Disques de Jazz, Paris: Robert Laffont, 1951. Christopher A. Pirie with Dr. Siegfried Mueller. Artistry in Kenton: The Bio-Discography of Stan Kenton and His Music, Volume One (Revised Edition), Vienna: self-published, 1969. John Flower. Moonlight Serenade: A Bio-discography of the Glenn Miller Civilian Band, New Rochelle, NY: Arlington House, 1972. Walter C. Allen. Hendersonia: The Music of Fletcher Henderson and His Musicians — A Bio-Discography, Highland Park, NJ: self-published, 1973. Richard S. Sears. V-Discs: A History and Discography, Westport, CT: Greenwood Press, 1980. Chris Sheridan. Count Basie: A Bio-Discography, Westport, CT: Greenwood Press, 1986. Chris Sheridan. Dis Here: A Bio-Discography of Julian ‘Cannonball Adderley’, Westport, CT: Greenwood Press, 2000. Chris Sheridan. Brilliant Corners: A Bio-discography of Thelonious Monk, Westport, CT: Greenwood Press, 2001. Chris Sheridan. Bags’ Grooves: A Discography of Milt Jackson, Parts 1 & 2, Almere, The Netherlands: Names & Numbers, 2006. Frank Büchmann-Moller. You Got to Be Original, Man! The Music of Lester Young, Westport, CT: Greenwood Press, 1990. Coover Gazdar. First Bass: The Oscar Pettiford Discography, Bangalore, India: self-published, 1991. Edward Berger. Basically Speaking: An Oral History of George Duvivier, Metuchen, NJ: Scarecrow Press, 1993, 231. Bertil Lyttkens. The Jimmie Lunceford Legacy on Records, Stockholm: self-published, 1996. Edward M. Komara. The Dial Recordings of Charlie Parker, Westport, CT: Greenwood Press, 1998. Luciano Massagli and Giovanni M. Volonté. The New Desor: An Updated Edition of Duke Ellington’s Story on Records, 1924–1974, Parts One and Two, Milan: self-published, 1999. Morroe Berger, Edward Berger, and James Patrick. Benny Carter: A Life in American Music, Second Edition, Volume II, Lanham, MD: Scarecrow Press, 2001. Bob Weir. Lucky Thompson Discography, Almere, The Netherlands: Names & Numbers, 2010. Dieter Salemann. Roots of Modern Jazz — The Be Bop Era, Vol. 13: Solography, Discography, Band Routes, Engagements of Eli ‘Lucky’ Thompson, 1943–1950, Berlin: self-published, 2001. Gary Carner. Pepper Adams’ Joy Road: An Annotated Discography, Lanham, MD: Scarecrow Press, 2012. Edward Berger. Joe Wilder and the Breaking of Barriers in American Music: Softly, with Feeling, Philadelphia, PA: Temple University Press, 2014, 315–363. Noal Cohen. “Jazz Discography in the 21st Century: One Perspective,” Names & Numbers 65, (April 2013), 15–19. These are the lowercase letters that BRIAN automatically assigns to a track when it is added to a session. To put this another way, when perusing the database for instances of a performer also being a soloist, only the “Name” entries are searchable, not the “Details” information. So if Gryce had been listed in the “Details” column, he would not be found, just as in this example, neither Byrd nor Taylor would turn up as soloists in this particular group of exchanges. Originally from Rochester, NY, Noal Cohen is a Montclair, New Jersey-based jazz researcher and discographer whose main interests involve artists he considers worthy of greater recognition. He has published detailed discographies of several musicians that he feels fit this category at http://www.attictoys.com. He also writes and edits liner notes and has contributed articles to Coda Magazine, Discographical Forum, IAJRC Journal, Names & Numbers, and Current Research in Jazz. With Michael Fitzgerald, he co-authored Rat Race Blues: The Musical Life of Gigi Gryce, an award-winning biography of the saxophonist and composer (http://www.gigigrycebook.com). The inclusion of solo information in jazz discographies is a useful complement to the basic data found in such compilations but one that is restricted by practical considerations to specialist works such as those limited to the recorded history of a single artist. Among the many benefits of addressing jazz solos, perhaps the most compelling is that the compiler is forced to listen carefully to the recordings and is thus able to identify and correct errors in personnel, instrumentation, track timing, and issue content found in many sources including other discographies and even original liner notes. Diverse approaches to handling solo information in discographies have been utilized historically, some quite simple, others arcane, and a survey of representative examples of these is presented herein. With the advent of computer technology, discographers are now equipped with tools that facilitate the entry and display of data. 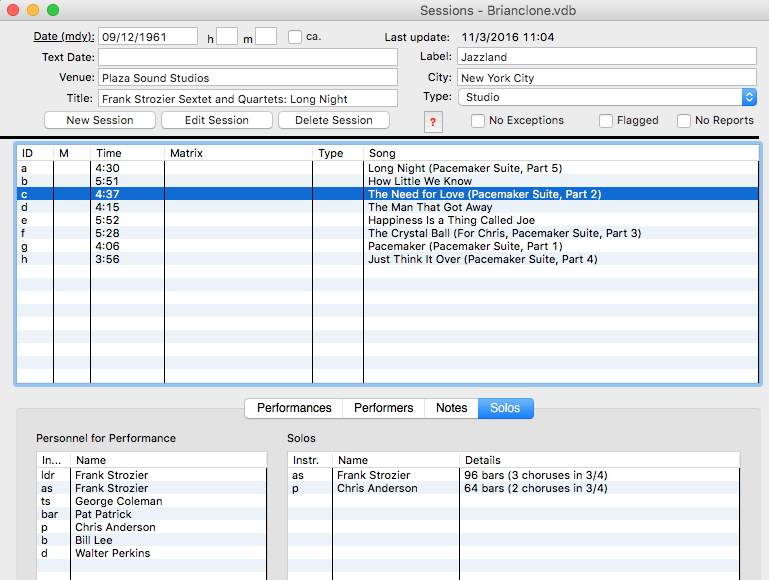 The BRIAN application, introduced in 1997, has evolved into a particularly robust program for discography compilation and early results using this software for incorporating solo data into existing artist discographies are presented with several examples that demonstrate flexibility and ease of use along with some problems that will require future refinement. Chicago 15th ed. : Cohen, Noal. “Compilation and Display of Solo Information in Jazz Discography.” Current Research in Jazz 9, (2017).